The M-9A is a separate procurement, they really should put it out as M-11 as it can be a completely different and non-compatible car with the M-9. The major difference is the funding, the M-9 KRC cars are funded by NYS, whereas the cars billed as M-9A are funded by the Federal Government as part of the FTA- East Side Access funding. I can add with certainty that the C3 prototype LIRR bi-level coaches were tested and found to fit the Third avenue tunnel and is approaches. MNCR Bi-level MUs would be a viable choice, if not taller that 14'3" tall. This testing is ancient history a la 1991. I am surprised no images have been posted online of the test trains in Pueblo, Colorado. They will be testing on the LIRR soon, perhaps April or so. This year they can finally get production going. I suggest the MTA keep the M3 online and not phase them down right now even as M9 orders come in as they can use the cars for additional service capacity. LIRR is actually short railcars which is why thet are leasing cars from MARC right now. I alos believe LIRR should max out options to replace damaged trainsets in accidents and for additional capacity and to phase out the M3 railcars in future years. Between new Brooklyn track at Jamaica, and East Side Access and Hamptons Cannonball service, the LIRR is going to need all the M9/M9A including options in future years. For now,a major failure/wreck will split a pair of M-3's,or take the pair completely out of service and become parts donors. 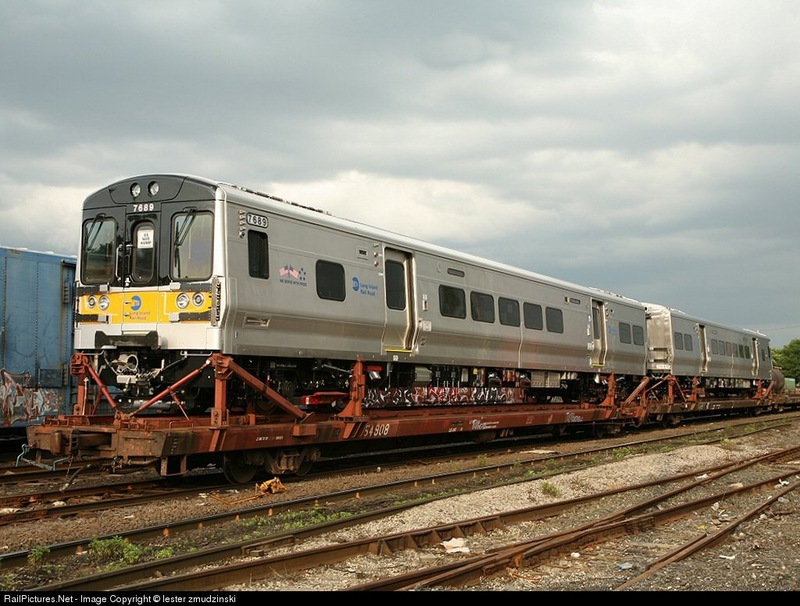 LIRR has a shortage of loco hauled cars(the C-3's),that's why the lease of cars from MARC's fleet. Backshophoss wrote: For now,a major failure/wreck will split a pair of M-3's,or take the pair completely out of service and become parts donors. True but the MARC lease is temporary. Can the M3 or M7 or M9/M9A use diesel locomotives? If not, where will the additional train cars come from for the diesel part of the network? The only order I know of is the M9/M9A. Due to how the air brake system is set up for the LIRR M-3's and M-7's,they are only towed by diesels when needed(shop tow in,emergency tow). Without 3rd rail power NO heat/AC,lights,working bathrooms,non working doors,etc,batteries will last a very short time. Only way to stop is to place the brakes into Emergency when towed! MNRR M cars are setup for normal brakes and can run in conventional train set but nothing other than brakes will work. LIRR M cars have their own brake setup and can only be towed in an emergency. never understood why LIRR choose this set up. Someone know? Amazing how even today there is still so much difference between LIRR and M-N even though they are run by the same parent agency. Effectively they are still two separate railroads that happen to buy similar equipment. geico wrote: MNRR M cars are setup for normal brakes and can run in conventional train set but nothing other than brakes will work. The LI M1/M3 arrived with the D-1-A triple valve to allow full brake pipe control of the air brakes when towed by a locomotive. This valve, and the related apparatus was another maintenance item that would have to be inspected, cleaned and tested, (and the related expense) for marginal benefit. Remember, if these things are being towed by a locomotive, something is wrong, and they're not losing any additional revenue pulling them at 15 mph vs 40 mph if they had the valves. LIRR opted to remove them, and also when it came time to purchase the M7, left them off altogether, at a significant savings per car if I remember. Head-end View wrote: Amazing how even today there is still so much difference between LIRR and M-N even though they are run by the same parent agency. Effectively they are still two separate railroads that happen to buy similar equipment. ok MN cars can be moved as freight cars in conventional freight trains (90 lbs brake pipe/ direct release) only. which is convenient when rescues are made or cars have to send out for overhauls. Last edited by Jeff Smith on Fri Feb 16, 2018 12:36 pm, edited 1 time in total. The LIRR M-1's and M-3's were placed on flatcars when shipped new from the factory,believe the M-7's were also shipped from BBD on flat cars. Figure on the M-9's for LIRR will also be shipped on flat cars from the plant in Lincoln NE. correct no tractor trailers or highway moves.